I got very excited on Friday. My new Blocking Board arrived. A new bit of crochet technical kit. I have spied this board on the internet and have desired to have my own for a while. ‘Blocking, what on earth and why?’, I hear you cry. Well if I am ever at a workshop, trade fair or interviewed by a magazine, and they say; ‘What is your top tip?’. My answer is always; Blocking. Beginners and seasoned crocheters alike avoid blocking their work and it is easy to see why. If you have just finished a garment or a beautiful blanket you are impatient to show off your finished piece and then start your next project. But once you have invested in yarn and spent so many dedicated hours finishing your project, there is nothing more crushing than a blanket that looks more at home in a dog basket than displayed proudly on your sofa. Blocking make an enormous difference to your finished projects, and many crocheters will testify to the fact that once you start you never go back to your old impatient ways. .
During the making process the fibres of the yarn can often become crumpled and creased. By blocking your work, the fibres can relax, the stitches become regular and your can set your finished piece to the measurements you require. There a number of techniques which can be used and dependent on the project you can choose different options. Obviously toys, amigurumi, bags and coasters do not need to be blocked. Items like lace shawls, scarves and blankets should be ‘hard’ blocked. Garments can either be wet blocked or steam blocked. In all cases the items need to be wet enough to so that the fibres relax and you can re-shape them into their final position. 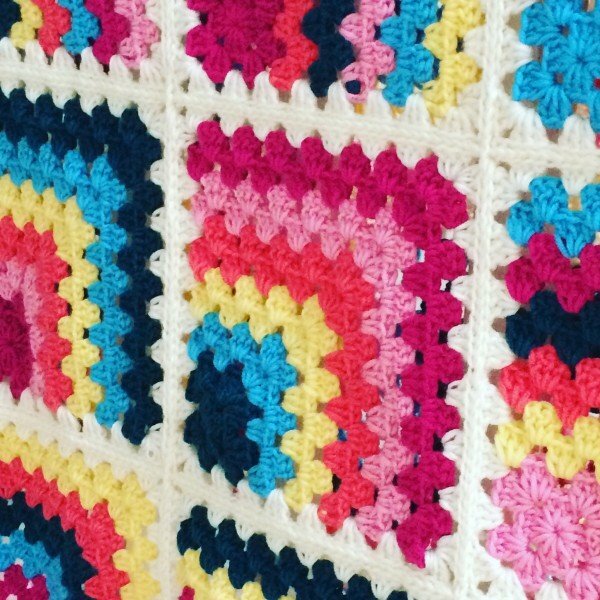 Blocking – what do I use? 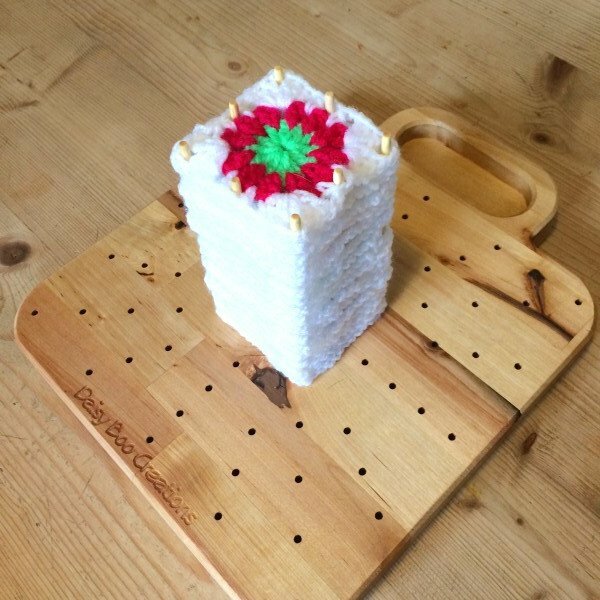 Well I have just bought this lovely new board from Daisy Boo Creations. 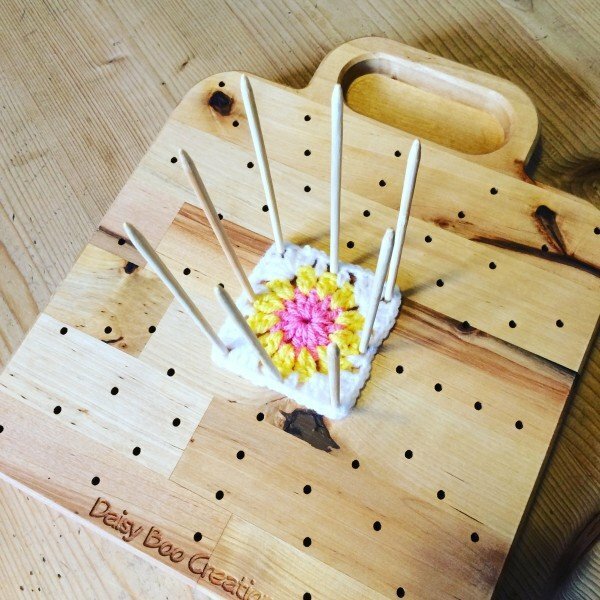 I make quite a few Granny Squares and this board will enable me to stack a number of squares in exactly the same shape on these wooden dowels. Firstly do check the ball band to ensure that you can get the yarn wet. I then dampen the square using a waterspray, which you can buy from most supermarkets. I will then pin out the square to the size and shape you need. which I notice even John Lewis are stocking now. This has a printed grid line system which is really helpful for garment blocking and granny squares. Take your project and lay it on you blocking surface. Start at one corner and pin gradually along the edges, gently pulling the crochet into place and securing with a pin. As you work around the edge of the piece, you might notice that you have pulled one area more taut than another, simply remove the pins and reshape. Once you are happy with the overall dimensions, spray it all over with tepid water. Leave to dry. Many designers wet block their garments as the process fully sets the seams together and it is the process which will be used every time the garment is washed. Soak the item in a little lukewarm water, you can add a little no-rinse wool wash and leave for around 20 minutes. Then drain your sink and very gently squeeze out the water, but do not wring the garment. Ensure that you scoop your item out of the sink and do not hang it out as this will stretch the fibres. Lay the garment between two towels and gently roll the towels up to remove as much of the excess water as possible. 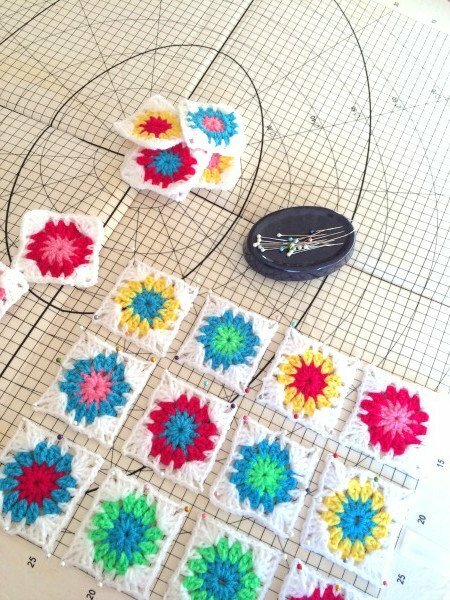 You can then lay your item out on your blocking surface and gently pin it out into the measurements you require. This is a slightly faster version of the process above, and is good for removing persistent creases from garments. Lay your crochet out on the blocking surface and use a steam iron or garment steamer to allow the hot steam to permeate the fibres. Make sure you don’t let the iron touch the crochet, because it will easily flatten textured stitches and totally ruin any acrylic yarn, making the crochet limp and lifeless. In all cases of blocking, make sure the crochet is totally dry, ideally leave your work for 2 or three days if you can. Essentially this is my top tip for all crocheters. It will make an enormous difference to your finished work. I promise you – you will thank me later.